Schizophrenia is a Greek term that roughly translates as “shattered mind.” It is a chronic, severe, and disabling brain disorder, in which people’s thoughts create an abnormal interpretation of reality, often containing delusions and hallucinations. In often times schizophrenia will cause a person to withdraw from the people and activities they used to perform and instead form a separate reality. Schizophrenia is a relatively common disease. Approximately 1 percent of the world’s population suffers from schizophrenia. The onset of symptoms in men usually begins earlier than women. Studies have shown that this is a genetic disease with an increased percentage in developing it if one or more parents have been diagnosed with schizophrenia. Schizophrenia symptoms can be categorized into 3 categories. Positive symptoms- Positive symptoms can come and go, they are the most easy-to-spot because of the unusual thoughts or perception. These include hallucinations (something a person sees, hears, smells, or feels, that no one else can), delusions (often seen in paranoid schizophrenia, can be extreme such as the belief that people are spying, cheating, chasing, or poisoning them), thought disorder (difficulty organizing thoughts or “thought blocking”, and disorders of movement (clumsy and uncoordinated). Negative symptoms- represent a loss or a decrease in the ability to initiate plans, speak, express emotion, or find pleasure in everyday life, as well as, even neglecting everyday hygiene. These symptoms are harder to recognize as part of the disorder and can be mistaken for laziness or depression. Cognitive symptoms - problems with attention, certain types of memory, and the executive functions that allow us to plan and organize. Cognitive deficits can also be difficult to recognize as part of the disorder but are the most disabling in terms of leading a normal life. 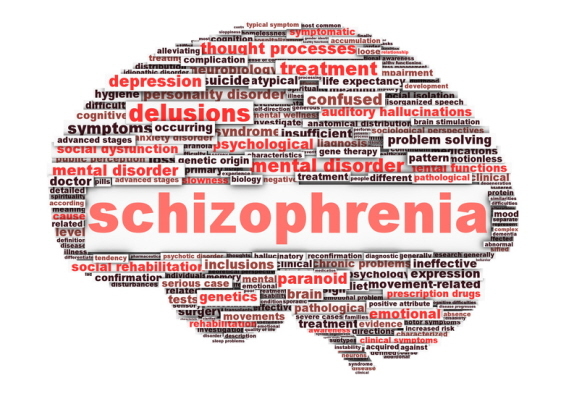 While there is no cure for Schizophrenia it is a treatable disease in that the rate of the recurrence of psychotic episodes can be significantly decreased by being on a medication. Most people suffering from this disorder who respond to the medication well can end up living productive and fulfilling lives. Researchers are developing and using new research tools to understand the causes of schizophrenia and find ways to prevent and treat it. Many of the antipsychotics out there help alleviate the positive symptoms. In most cases results can be seen within the first few days or weeks, but the maximum treatment results may not appear up to 6 weeks later for full effect. You can view all the current studies that are underway or next to start soon, or fill the form by clicking in the red box below. You can request an appointment without compromise to visit our facility or talk to one of our doctors. You can also CHATONLINE with one of our representatives in the "CHATBOX LIVE SUPPORT".